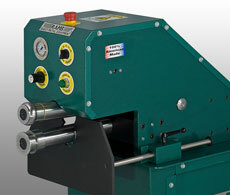 This machine is capable of producing Beading, Crimping, flanging and other specific functions. Aside from our competitors, the RAMS 2019 has several beneficial user friendly features, Including: A main switch and air regulator. An integrated roller storage system to house your more commonly used roll sets. The user Friendly Control panel allows "on the fly" pressure and speed adjustments. A unique square drive shaft that is stronger and eliminates the need for keyways. 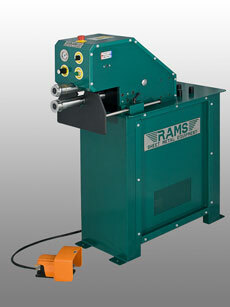 A time delay roller rotation can be adjusted to allow rollers to begin rotation prior to or after material contact. An easy adjustable oversized back gage. A full 12" throat depth with no interference. 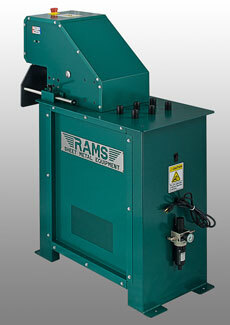 A pressure sensitive foot pedal allows the user to control the time it takes the rollers to contact the material.